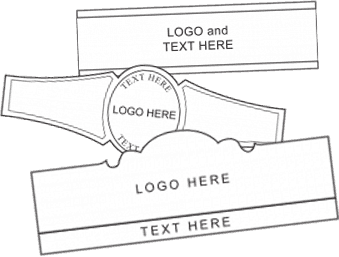 Choose your cigar band template from our numerous available design options. Select the quantity of bands you would like to order (minimum 50). Select “Standard” setup fee of $9.95 or upload your own artwork or image for a “Custom” fee of $35.00. Input your wording into the fields corresponding to locations in the template, type “none” to leave blank. Complete your payment and shipping information to finalize your custom cigar band order. Review the email notification we send you to review and approve your order prior to processing. Personal Cigar Bands can make your fully custom cigar band happen! Usa any of our custom cigar label templates as a guide and upload your own design. The sky is the limit on your creativity. We accept JPG, PNG or PDF files.